If you want to keep your slot playing seasonal then fear not – we've got a selection of some super-chilled winter-themed games to spin while it (possibly) snows outside. Below are five of the wintriest and coolest online slot games around, and you can get some decent wins on them too, if you're lucky. A game from innovative developers Yggdrasil, this slot features rather juicy looking winter fruits that can be matched up across five reels and 25 paylines. There's the howl of a wintery wind in the background, and a suitably jangly winter theme and sound effects. The best thing about this slot is the variety of interesting paylines. You can see what they are and their value at any time by simply hovering over the numbers on the side of the reels – a nice touch from a developer that likes to shake things up a little. Another five-reel, 25 payline offering, the Cool as Ice online slot is a low-variance game from Genesis. It's got a generous selection of bonus and game modes including expanding iceberg wilds and husky races, as well as a free spins feature. Set on what looks like an iceberg, there's a light-hearted cartoony feel and an equally fun soundtrack that bounces along in the background as you spin. The 12,500-coin jackpot is pretty cool too – if you manage to win it, of course. Another pretty light-hearted slot from Gameplay Interactive, the aim of the game here is to defeat the terrifying frost dragon – although it actually looks quite friendly. The game has five reels and 20 paylines, and a free spin feature. The dragon itself is the scatter, and the symbols are all suitably monster-themed, with the yellow shark being the highest value. Good fun if you want something fairly traditional gameplay-wise, with a slightly quirky wintery theme. We couldn't do a list of wintery slots without at least one Christmas one, so here it is: the Jingle Spin online slot by NetEnt. As you might expect, this one has all the trademark NetEnt polish, so you're greeted with the sounds of a roaring fire and a chirpy festive song as soon as the game loads up. The graphics are excellent, and while the depiction of Santa is a little quirky, it does make this game stand out. 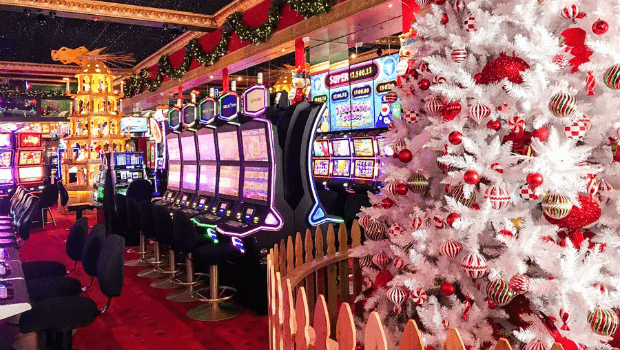 There are five reels with 20 paylines on offer, and you can get some nice wins from the baubles feature, which include cash prizes and free spins. While it's not that high variance, the features and presentation make this a good fun slot to spin during the holiday season. A bit of an oldie this one, but quite an interesting slot nonetheless. Snow Business sees you helping out a penguin fishing for, presumably, massive cash prizes. What sets this title apart from the others on the list is that it's a progressive jackpot, so you can potentially grab an impressive win. The game features polar bears and seal symbols as well as traditional numbers and letters. While the presentation isn't up to par with more modern titles, and the RTP is pretty low at 92%, it's fun to play if you're feeling lucky and want the added possibility of a major cash win.